Cody and Kara Goodknight are newlyweds, and the fifth generation of Goodknights ranching in Tillman County, Oklahoma. The Goodknights are proud to carry on the family tradition and bring new technology and ideas to the ranch. 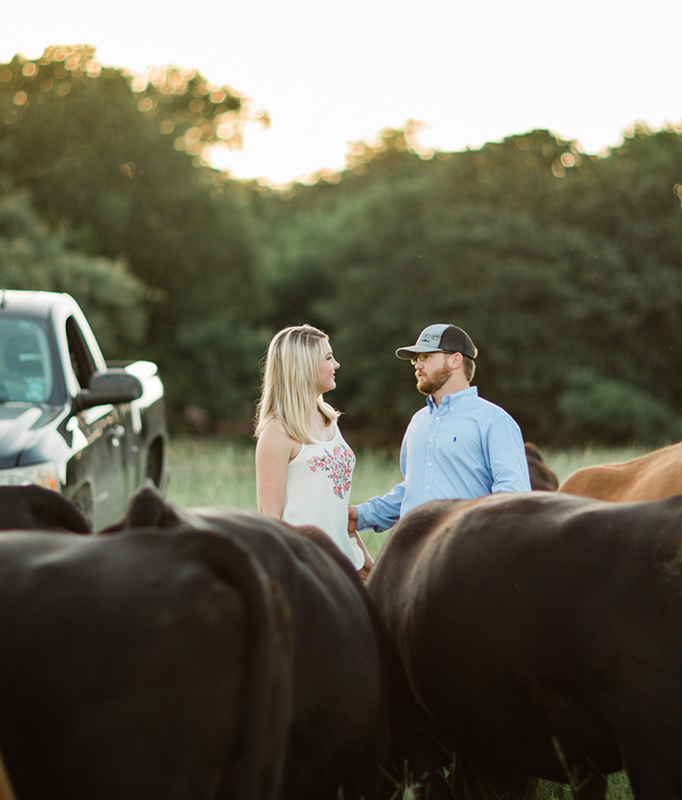 Cody and Kara Goodknight are newlyweds, and the fifth generation of Goodknights ranching in Tillman County, Oklahoma. They are in partnership with Cody’s father, John, where they farm about 6,000 acres of cropland and 2,000 acres of native and approved grass. The Goodknights are proud to raise replacement heifers, that are sold to local ranchers, and stocker cattle on their wheat and summer grass. The answer is always feed the corgis--first and foremost. Then we feed all the cows. During the spring and fall we have cattle in the pens, and we will check them. If we don’t have cattle in the pens conditioning, then we will feed and check the cattle on the grass pastures, and check in with our two full-time workers. During planting and harvesting season we spend a considerable amount of time in the field. Otherwise, we stay close to our shop doing maintenance and repairs on our equipment. Kara, a financial advisor, has an “in-town job,” which means in addition to her full-time career, she also works on the ranch in the evenings. How has technology changed the way you farm now compared to earlier generations? Two things are game changers for us in our operation. GPS and the guidance it provides for our equipment is one of the best technologies we use. It allows us to put in more hours a day and be less fatigued when we come home to our family. When dad and grandpa were working, they didn’t have access to GPS technology and would come home extremely tired. The second is our drone. This came in handy last year when we had seven inches of rain. I saw a cow, and she had a calf down by the pond, but it was completely inaccessible and I wasn’t able to get to her. I flew the drone and I was able to see the calf had it’s ears up and was cleaned off. Then I didn’t have to risk our safety to go and check on her. .
What management practices do you implement to ensure you're being cognizant of water use and taking care of your land as well as the livestock? Are there any specific practices that you put in place? We implemented no-till farming in 2000, so this will be our 18th crop as no-till. We strive to keep the ground covered at all times in order to prevent evaporation of moisture, as well as different types of erosion -- wind and water erosion, mainly. This means we are preparing the land for the months of dry times as well as the hard and fast rains. Additionally, we have always maintained a rotational grazing system with our cattle and our native pastures. This helps with weed control, as well as the rotational mob grazing effect. We've also implemented cover crops between the cash crops. This practice allows the root systems of those cover crops to improve water and filtration by providing channels for rain flow back into the soil instead of runoff into streams. What does sustainability means to your family? Sustainability has two aspects. One is economical. We have to be sustainable in our operation to provide not only a living for ourselves, but a living for the people that work for us, and our children in the future, as well as future generations that may want to work for our farm and have a career in agriculture.The second part of sustainability is our environmental impact. We strive at Goodknight Farms to leave the land in better shape tomorrow than we found it today. If you could explain one aspect of agriculture or the beef industry to someone who isn’t familiar with agriculture, what would it be? I would like to address the necessity of farmers and ranchers. We are extremely important to the ecosystem of the entire world. 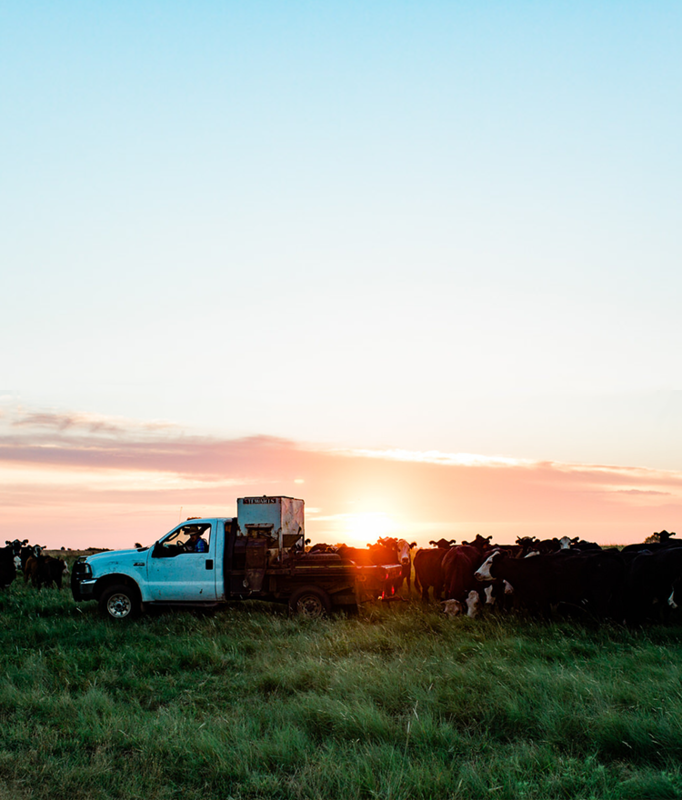 Ranchers utilize the land, the sunlight, and the rain--we transform each into nutrients that we need for our body through plants and animals. What is your favorite cut of beef and how do you like to prepareD? A Rib eye over a good charcoal grill. Between 6-12 months of age, cattle spend time at stocker and backgrounder farms and ranches where they graze on a variety of pastures. Here they gain weight and convert forage and grass into lean protein. The Chapman family has called Ardmore, Okla. and Rock Prairie, a cow-calf ranching operation, home for four generations.